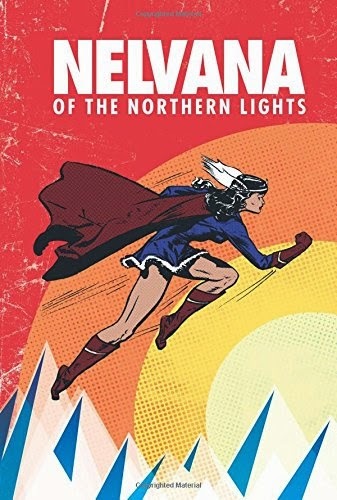 One of the books I was most hoping to get my hands on last year was the collected Nelvana of the Northern Lights by IDW Publishing. Still with a lot to learn about the history of comics, I was shocked that Nelvana had not crossed my radar until then. It's especially unusual that I also pride myself on Northern literature and Nelvana was largely set here. Nelvana, where have you been all my life? First off, huge props to IDW for the packaging. The hardcover and artwork has a retro-cool, classy vibe, underscoring the importance of the character and her comics. Plus they've included a whole slew of extras that enhance the product, from historical information, to insightful commentary, to various other artist interpretations of the character (the only one I recognized was Jeff Lemire, though there are plenty of great ones). But beyond the historical significance and well-put together product, is it any good? I wasn't holding my breath for that. Old superhero comics tend to be pretty cheesy and often offensive. To be sure, Nelvana was both of those things. (The depictions of Japanese people is downright awful.) Still, the writing and artwork wasn't as bad as Captain Canuck and indeed, there were things I liked. In particular I was surprised and intrigued by Dingle's panel work. I thought that most superhero comics traditionally stuck to rectangular frames that acted as pretty rigid containers, and horizontal layouts. In Nelvana, however, Dingle toyed with other shapes, such as circles and irregular shapes, often speech balloons and characters extended outside of the panels, and sometimes the panels were even placed at a diagonal to the page. The result is frenetic and perfectly matches the fast-paced adventure stories. I think Nelvana could make a comeback. These 6 years worth of comics present a very inconsistent and imperfect view of Nelvana. Her ethnicity seems to vary; her brother gets forgotten altogether; and her superpowers seem to come and go, often with new ones suddenly appearing just in time. And, like many old superhero comics, they're largely plot-driven, without a lot of sense of who Nelvana is as a person. But as Benjamin Woo points out in an essay at the beginning, writers of superhero comics have often played with their characters and storylines, dropped powers and plots are not uncommon, but typically a lot of these wrinkles work themselves out over time and readers eventually end up with a consistent idea of the character and what he or she is all about. 6 years was simply not long enough. However, I think there are enough seeds to bring this character back to life. I also think some of those weaknesses can work in the book's favour if done right. An obvious hurdle a new writer would need to approach carefully and with sensitivity is her race. Nelvana is presented early in the series as one of the Inuit, yet she is drawn different from them, and later she approaches them as an outsider, as if she never had been an Inuk at all. What's interesting though is that her mother's identity is never revealed, only that she was a mortal. Perhaps it could be that Nelvana never knows her human race, switching into the guise of whatever ethnicity she currently is working around, feels a connection with, or as necessary. This could also provide the character-building that she was so sorely lacking in the old comics. It could be a source of tension between her and her father who refuses to tell her her mother's identity. It would allow brave and sensitive writers all sorts of challenging cultural/societal exploration and complex themes. Perhaps authors of all ethnic backgrounds could eventually have a shot at the character. It couldn't just be that of course, it would still need to be primarily about superpowers, crime-fighting, and mystery-solving, but with mature, intelligent, and insightful social commentary underneath it all, I'd be in! It should surprise no one that I have never heard of this character before. Glad to hear that Canada Post has, though! The 8th Canadian Book Challenge- Halfway Point!